In fact, I love Chicken Francaise so much that during my freshman year in college when the cafeteria had failed spectacularly in their attempt to make it (they added raisins and made it sweet….NEVER add raisins or make it sweet, it’s gross), I went home that weekend and asked my dad for an emergency dinner at one of our favorite Italian restaurants. I still shudder thinking of those raisins….I stress that they should NEVER be added to a savory, lemony dish…:::shudders:::…but I digress. About three years ago, approximately April of 2013, Matt and I opted for takeout from our favorite local Italian joint. I remember the date because Matt encouraged me to order anything and everything from the menu for reasons unbeknownst to me. It was after the fact that he admitted that that was the day him and his mom were in a jewelry store picking out my engagement ring. That day in particular, I had a craving for Shrimp Francaise. I had tried the chicken, I had even tried a flounder version from one of our favorite seafood restaurants. But shrimp? Never. Fast forward to a few years later, Matt and I decided to try making Shrimp Francaise to add some new dishes to our repertoire. 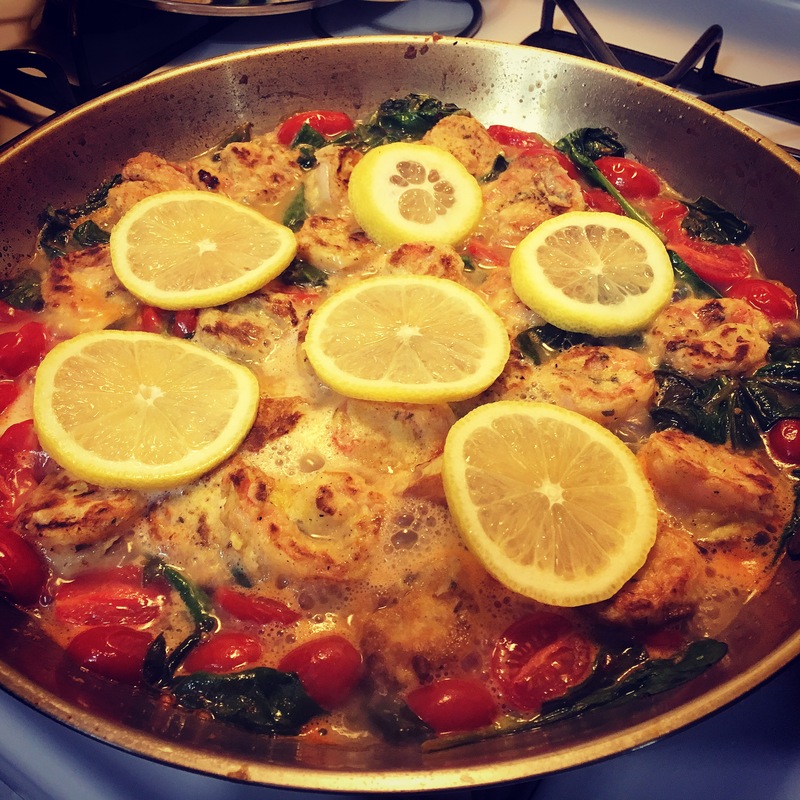 The end result was a delicious lemony and buttery seafood dream, with some fresh sauteed spinach and cherry tomatoes that were bursting with flavor! Seriously, cooked cherry tomatoes–look into it and do it. And as for spinach, buy it fresh in bulk and you will yield many meals: a nice salad, a sandwich topping, and of course, cooked in Shrimp Francaise. Fun plays on classic dishes are always a great way to spice up your culinary technique in the kitchen. This one is definitely a keeper. 1) In a small bowl, mix in eggs and tablespoon of lemon juice. In a small pan, mix flour, paprika, and black pepper. Dredge each shrimp through flour mixture, then egg mixture. Place shrimp in pan over medium high heat with a little oil in pan. Brown on each side and let it cook almost all the way through, then remove from pan. 2) Into pan, add tablespoon of flour and butter to create a roux, then add white wine, chicken broth, squeezed lemon juice, and tomatoes. Before the tomatoes begin to burst, add the spinach and shrimp. Place lemon slices over top. 3) Cook until spinach begins to wilt and tomatoes burst. Remove from heat, season with salt if desired, and serve over pasta.